This post actually belongs on my other blog, My Moment in Time, but, since I haven't been commenting much here in the last week, I'm posting it here, so you can see what I've been doing instead of reading and blogging. I just spent a little over a week in Ohio. I hadn't been home in ten years. 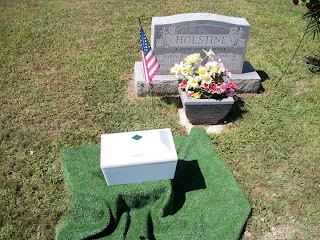 Despite the fact that it was a trip home to take the ashes of Jim and his father, Harry, it was still a wonderful visit, filled with family, friends, and so much love. If it seems as if there were a number of visits to cemeteries, that's true. But, these are family roots as well, and it provided an opportunity for my mother and me to talk about family. So, here, in pictures, is the story of my Ohio roots. My Mother, Elizabeth - Is it any wonder I always liked Louisa May Alcott? Although I had my camera, I missed some prime shots. My welcome home came at dinner with my sister, Linda and her family. Her husband is a wonderful cook, so he made dinner, and then we all sat outside on a beautiful Ohio night. I appreciated her sons coming for dinner so we could all visit. And, I missed taking pictures on Thursday night when cousins on my father's side of the family came to visit. Darn! My first job in a library was at the Huron Public Library, Huron, Ohio. They have a beautiful expanded and renovated building, totally changed from when I worked there. Just gorgeous. I had lunch with one of the librarians who made me the librarian I am today. Millie Schilman worked at the Huron Public Library when I was a page, and she was children's librarian there when I was the Director. Millie was one of the best children's librarians I ever worked with. Friday morning, my mother and I had breakfast with her side of the family, my sister, Christie, a cousin, Carol Jeanne, my Aunt Kathy, Aunt Janie and Uncle Kenny. Friday afternoon was spent at the Sandusky County Fair, where my niece, Elizabeth, was Goat Princess. She and her pygmy goat, Fred, brought home two wins, first in his class for 4-H, Wethers under age 1, and first in the open class for Wethers under age 1. And, when he competed against older goats, the judge said he had promise. Nice job, Elizabeth and Fred! And, of course, Elizabeth, the Goat Princess and her prize-winning goat, Fred. We went to a high school football game Friday night, and watched my nephew, Tony, a drummer in the marching band. (And, their school won that night, as did my high school, Huron.) What's more midwestern than a high school football game? 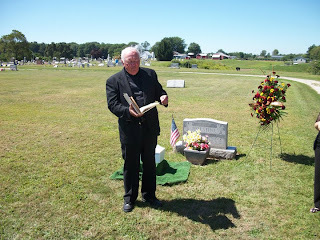 Saturday was the graveside service for Jim and his father, Harry. We had a beautiful service, led by Father Gerald Ceranowski. Thank you to the family and Jim's high school friends from Berlin Heights High School who attended. It was good to be with my mother and sisters on Saturday. They made the service easier, and then we shared the rest of the day - family and more memories. We all went out for Lake Erie perch for dinner. And, we took our traditional "step" pictures - the three of us on steps. This time, it was at the Huron Public Library, where we all worked as pages, and I returned as Library Director. Perfect spot. And, this picture means nothing to anyone but me. And, I only took it because I loved the look of this doorway. We talked to old friends at church on Sunday. And, then a friend of ours from Michigan (yes, Ohio State Buckeye fans do have friends from Michigan), came to visit that afternoon. Jim and I knew Howard for at least twenty-five years. We had a chance to talk, and go to lunch (for more perch). And, Sunday night Mom and I went to an outdoor concert put on by the Firelands Symphony. Monday, I fnally met friend and fellow blogger, Jen Forbus! We enjoyed lunch in Oberlin, but the highlight wasn't the food, but meeting Jen, who blogs at http://jensbookthoughts.blogspot.com/. Thanks, Jen, for taking time to meet for lunch! From Oberlin, we went to Westlake, where I had a nice visit with my other Aunt Janie. And, on the way home from her house, we saw two deer come out of the woods, and start walking east on the sidewalk right downtown. We ended Monday night with another tradition, a walk to the Pied Piper for ice cream cones. I ended Tuesday evening in the same spot, the Pied Piper, meeting a friend I've known since grade school, and catching up with Fran's life. Tuesday morning began with breakfast with Jim's Aunt Blanche. The next two days were actually spent at cemeteries. It was a tragedy in Clyde, Ohio, that led to some of our trips. McPherson Cemetery was the site of terrible vandalism, at a cost of over $100,000. 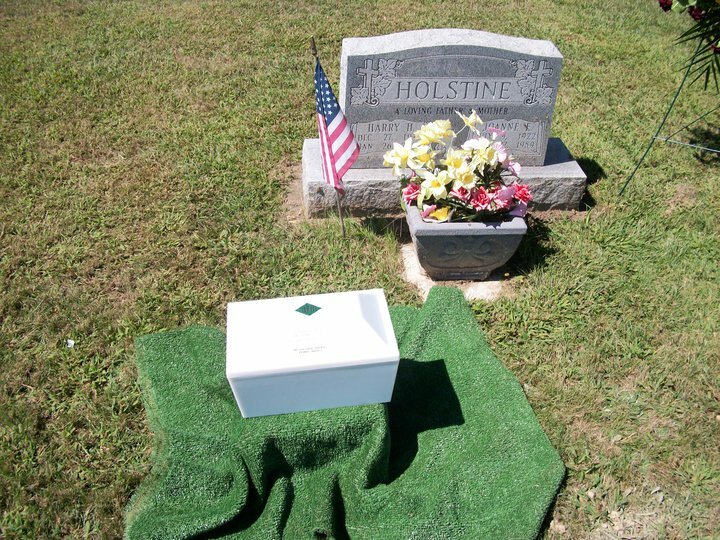 We went to check on a grave. That particular one was fine, but the destruction of so many tombstones of veterans, including historic tombstones, was on a massive scale. It was unbelievable, and, in my opinion, a true expression of evil. 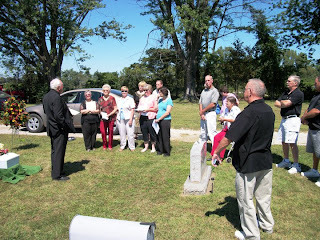 But, we also made the trip to cemeteries where family members were buried. Just a few here. And, before leaving Ohio, we went by the house my Grandpa and Grandma Growel lived during my entire childhood. These are my Ohio roots. It won't be another ten years until I return. It's still home. It sounds like you had a very emotional trip back home. The photos are lovely and would make a great photo book or scrapbook of your visit. You're right, Carol. It was a wonderful trip home. And, I have other pictures as well, that mean a lot to me. Thank you! Enjoy your long weekend as well. Lesa, I love walks down memory lane. Thank you, sweetie, for sharing yours with us. You are SO special and you do us all a great honor by sharing these personal moments. Oh, Kaye. Thank you. Everyone knew I was going home to Ohio. It just seemed appropriate, once someone in the family referred to it as a Roots visit. Thanks for sharing photos of your trip with us! What an emotional trip! I'm glad you got to finally meet Jen...isn't she the best? What a lovely post. I love the photos you opened and closed with. What a treat that you got to meet Jen Forbus!! You two are like kindred spirits, I'm sure. Jen Forbus is wonderful. I'm glad I met her. Just sorry we didn't have a chance to hook up since you were in Ohio at the same time! Thanks, kathy. I liked those pictures as well. Yes, I'm so glad I met Jen. We were never at a loss for words during the whole lunch. It was terrific. I thought of you so much while you were in Ohio. Thank you for sharing your journey, your family, your sorrows and joys, and your memories -- you have such heart, Lesa! This was a very special trip home. My sister, Christie, is probably right. She said this one will probably mean the most since I hadn't been home in ten years, and it was just packed with things to do. And, planning another visit in 10 months or so won't be quite the same. But, it's always good to return home. Who would I rather share that trip with than the friends I have here? Big hugs, Beth. Thank you for your friendship and all of your love. OK, you choked me up already. What a precious set of photos and thank you so much for sharing your journey with us. I know that it was emotional in many ways, but you have such a joyful smile on your face in each of the pictures. Big giant hugs to you! Wish I could have been a little fly on the wall or, heck, just attending the lunch with you and Miss Jen. I know you two had a blast. I'm so glad you got to make this trip, Lesa. Have a great weekend! Hi Lesa, Just found your post on DorothyL and am glad I did. I'm also a Buckeye and my first job out of school was as a bookmobile librarian for the State of Ohio. Great memories there. Despite the reason for the trip, it was a joyful trip. I said it was just a week filled with family, friends and love. I can't think of one moment in the whole trip that was disappointing. I was so thoroughly immersed in the moment that it was wonderful. Every second. You didn't need to be a fly! We would have welcomed you with open arms at that lunch. In fact, when Jen and I hugged, my mother said that was the picture she should have taken. A group hug would have been even better! I'm glad I made this trip, too. You never know when things will change suddenly, and this was a good time to make this trip. Oh, KK! A bookmobile librarian in Ohio. A beautiful place to travel around sharing books. What a great job. What section of Ohio did you work in? Thank you for sharing your Ohio roots. The photos are lovely, I especially like the 'step photo' of the 3 of you. Thanks for sharing. I hope it's not ten years before I get back to Ohio again! Oh, Lesa, what beautiful pictures. Thanks for sharing them and your lovely relatives. But not going back for 10 years? That seems hard as your family seems wonderful. Well, there is that invention by Alexander Graham Bell that comes in quite handy. Glad you enjoyed the trip and nice to see where you got your love of books--especially Louisa May Alcott, who must have been a woman ahead of her time. I am quite new to your blog but I really enjoyed this post. I feel as if I was with you on your trip home. Wonderful photographs - and I love the goat! What a beautiful and touching account of your trip. Thanks for sharing. We first did a step picture after 2 of us had left home, but we've been doing step pictures any time we got together. We like them, too! I hope you get back to Ohio before 10 years have passed, too. And, I have unlimited calling, kathy! But, I have seen my family. Everyone visited in Florida; my Mom & sisters came out to surprise me for my 50th. We do all enjoy each other, and I have seen them. But, life got in the way for a while. That made this trip extra special. Fred's adorable, isn't he, Hannah? We all love Fred. Thanks for reading my blog! And, it was my pleasure to share my visit home. Thank you, Brenda. It was a wonderful visit, so it was fun to share it. Thanks for sharing this with us, Lesa. I love that this turned out to be a joyful trip for you, despite the reason. You are such an inspiration. Thank you, Ingrid. I had great role models. My father died when my mother was 56, and she's been there every step of the way for me when I needed her. It was a joyful trip, shared with family and friends. It sounds like a wonderful visit..so glad you were able to see so much of your family. You're right, the vandalism at the cemetery is pure evil. I did have a wonderful visit, Kris. They caught 2 of the vandals, 17 year-old boys, although they think there were more involved. We'll see what happens from here. What is up with 17 year old vandals? The kids who vandalized our pool were 17 (4 of them) and 16 (1 of them). The 17 year olds were booked as adults and faced a felony charge. I hope they catch all the kids involved with this one. I hope they catch everyone involved in this one, too, Kris. And, we'll see if they're tried as juvs or adults. In this case, they'll probably get what they deserve as juvs. My cousin is the juvenile court judge. (grin) And, he's a veteran, and they damaged two of the veteran sections of the cemetery. So, we'll see. I don't know what the problem is with 17 year old vandals. Glad they caught the ones who vandalized your pool.